Nordstrom’s fan base is as fervent as ever. For the fifth time in a row, Nordstrom ranked as the nation’s favorite fashion retailer in an annual retail industry study conducted by Market Force Information (Market Force). Market Force polled over 10,000 consumers for the study, which ranks top fashion retailers, reveals retail technology trends and looks at spending plans and habits. Nordstrom, which has built a reputation for incomparable customer service, ranked first among the retailers studied with a score of 64%, up 6% from 2016. Dillard’s made even larger strides from last year, gaining 16% percentage points to rank second with 54%, and was closely trailed by off-price retailer T.J. Maxx, which earned a 53% score. Ann Taylor and Nordstrom Rack landed in the top of the rankings, after not making the cut last year, tying with Kohl’s for fourth place. [See Graph 1]. In the attributes that set one retailer apart from the others, Nordstrom, Ann Taylor and Dillard’s all performed exceedingly well. 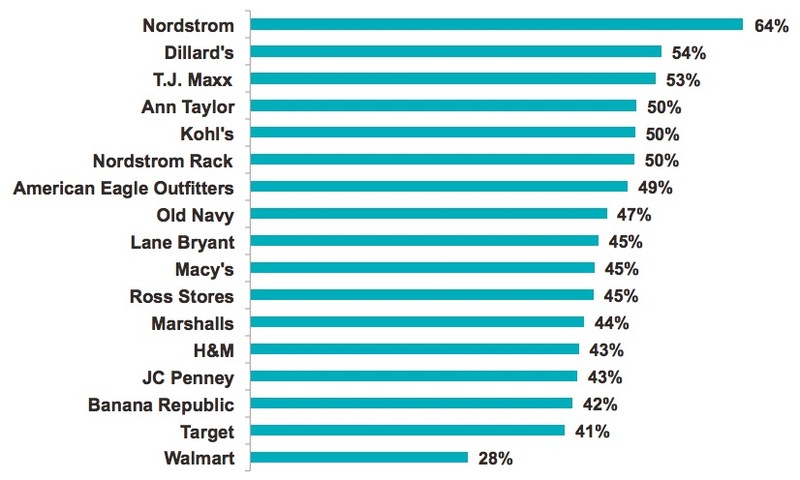 Overall-winner Nordstrom ranked first for value, atmosphere and ease of finding items, while Dillard’s took the No. 1 spots for creating a look and finding correct sizes. Ann Taylor landed in the top three in all of these categories. 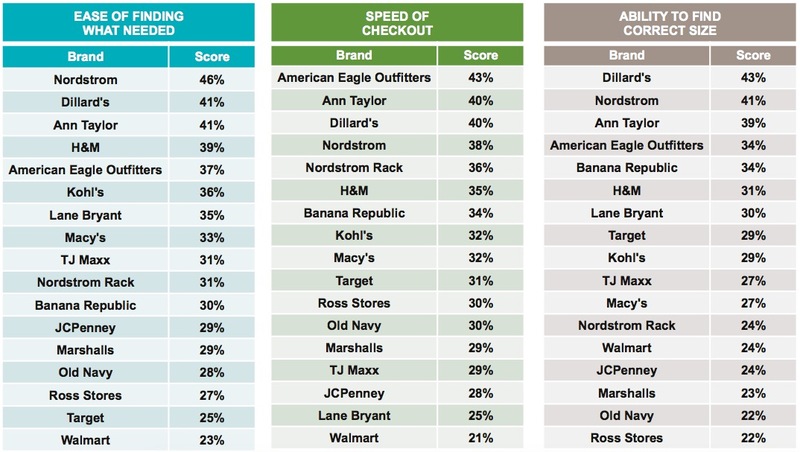 T.J. Maxx and Ross were called out for merchandise selection, and American Eagle has the fastest checkout speeds. [See Graphs 2 and 3]. 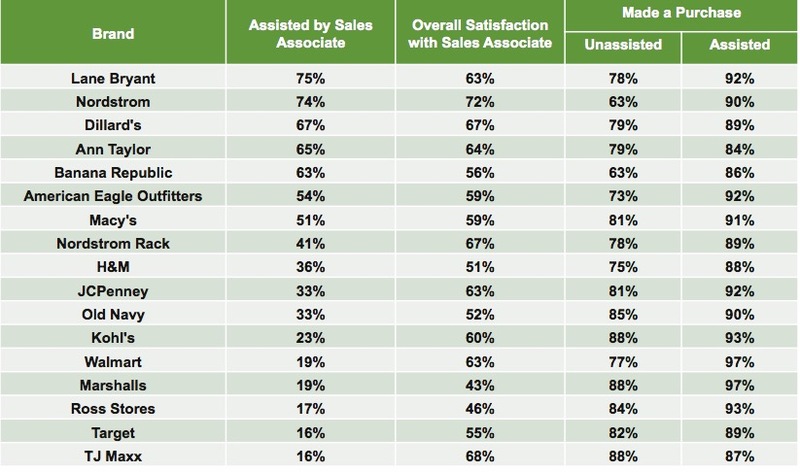 Despite the fact that sales assistance is shown to boost satisfaction and sales, less than half (42%) of consumers report being helped by an associate during their last shopping trip. 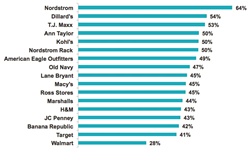 Lane Bryant’s and Nordstrom’s associates assisted customers most often, while Target and T.J. Maxx shoppers received the least help. [See Graph 4]. Consumer confidence is high, with 40% believing the economy will strengthen in the next year, whereas 31% think it will weaken and 28% think it will stay the same. That said, approximately 70% of consumers expect to spend the same amount on apparel and footwear this year compared to last, and just 11% plan to spend more. [See Graph 5]. Currently, people are shopping for clothes rather frequently, and brick-and-mortar stores remain relevant to fashion consumers. The study found 80% have shopped at one of their favorite retailers’ physical stores at least once in the past 90 days, and more than half have shopped at least three times in the past 90 days. Value is by far biggest deciding factor in choosing where to shop, followed by service, atmosphere and the ability to purchase merchandise on a retailer’s website. 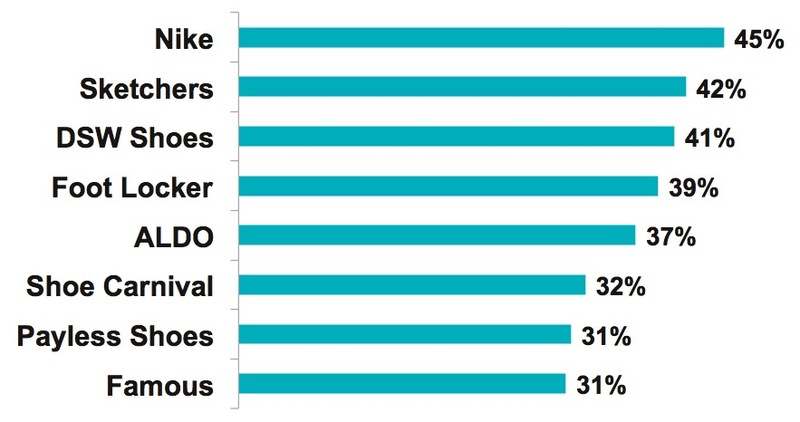 Lots of consumers are donning wearables, but not all types are equally desirable. Market Force found 39% of respondents own a wearable device, with the highest adoption among those under age 45. Health & fitness is the overwhelming reason for owning one (cited by 78%), staying connected to phones and other devices was second, and adding style was third. The most widely owned wearable devices are health & fitness trackers, and the most coveted are smartwatches. Smart eyewear and jewelry is seemingly less popular. In fact, while 36% own a fitness tracker and 12% own a smartwatch, less than 2% own smart eyewear or smart jewelry, and relatively few are interested in these devices. [See Graph 6]. 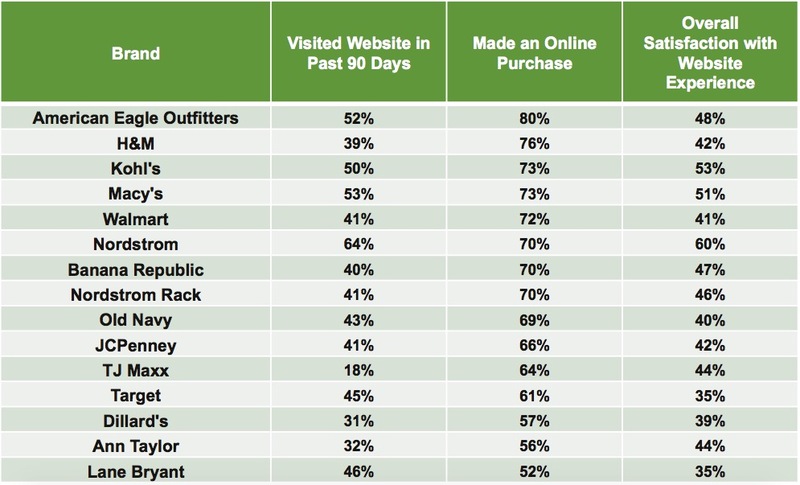 Three-quarters do not interact with their favorite fashion retailer online, but when they do, Facebook is preferred. Lane Bryant customers tend to be more interactive with the brand. In the growing U.S. footwear market, where annual spending tops $29 billion, Market Force found Nike is consumers’ favorite retailer. Sketchers, which ranked first in 2016, fell to second, followed by DSW Shoes, Foot Locker and ALDO. [See Graph 8]. Out of the attributes studied, Nike ranked first for store atmosphere and ability to find the correct size. Payless Shoe Source led in value and checkout speed, but faltered in many of the other categories. Foot Locker rated highest for selection and ease of finding product needed. For the rankings, Market Force asked participants to rate their customer satisfaction with their most recent fashion retailer experience, and their likelihood to refer the brand to others. The results were averaged to attain a Composite Loyalty Score. Only retailers with at least 100 locations were included. The survey was conducted online in December 2016 across the United States. There was an overall pool of 10,714 respondents covering all four U.S. Census regions. Within the survey pool, 7,241 reported shopping for fashion at a favorite retailer within the past 90 days, and 5,494 reported shopping for shoes within the past six months. There was a broad spectrum of income levels, with 54% indicating incomes of over $50,000 a year. Respondents’ ages ranged from 18 to over 65. Approximately 75% were women and 25% were men. Market Force Information® provides location-level measurement solutions that help businesses protect their brand reputation, delight customers and make more money. Solutions include customer experience surveys, mystery shopping and contact center data integrated on one technology and analytics platform. Founded in 2005, Market Force has a growing global presence, with offices in the United States, Canada, United Kingdom, France and Spain. It serves over 350 clients that operate multi-location businesses, including major retailers, restaurants, grocery and convenience stores, financial institutions and entertainment. More information can be found at http://www.marketforce.com.